Saint Mary's has participated in the RecycleMania competition & continues to update its waste policies and procedures to ensure consistent disposal of items. We're moving in the right direction. For Fiscal Year (FY) 2017, we sent 439 tons of waste to the landfill, down from 509 tons in FY 16 and 655 tons the previous year! This has increased our diversion rate to 55% this year (meaning 55% of the items we get rid of are either recycled or composted). What goes in what bin? Need a poster or flyer of these for your event or building? Email SMCsustainability@stmarys-ca.edu and we'll pass some along. Please visit this link for instructions on how to recycle your toners. Staff can now obtain compost pails for their office kitchens. It is an opt-in program, meaning you are responsible for discarding the compost at one of our locations. Fill out this form to request your pail. 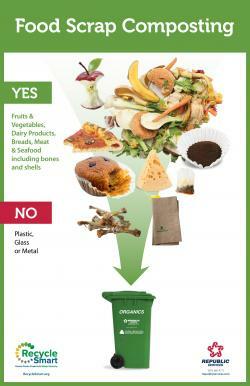 As a reminder, our compost takes all food products (incl. coffee grounds, bones, egg shells) and paper products (ex. napkins, paper towels, paper cups/bowls/plates, coffee filters). Unfortunately, our compost does NOT take utensils, even if they are marketed as "compostable" or "biodegradable" - these items take too long to properly decompose. What goes into Recycling (usually blue) bins: aluminum cans, cardboard, glass, paper, plastic (any kind), junk mail, catalogs.These co-mingled materials are then taken off campus to be separated. During the last 6 months of 2007, the College recycled 27,720 lbs. of these mixed materials. After new recycling bins were distributed in February, 2008, recycling increased to 34,340 lbs in the first half of the year. For the last 6 months of 2008, recycling reached an all-time high of 48,284 lbs. 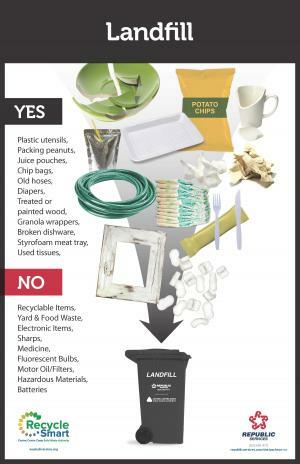 What can not go into the Recycling bins: styrofoam, electronics (collected during E-waste days), fluorescent bulbs (collected by B&G),batteries, toner or ink cartridges (take to Warehouse), food waste, CD's and DVD's. Recycling Service Requests. The recycling crew empties the smaller blue recycling bins in classrooms and offices on a regular basis. They empty all the larger outside bins for Residence Life as necessary. All recycling is transported to the holding area and picked up by waste management when full. The cardboard bales are picked up by Weyerhaeuser Trucking. If you have any recycling requests or needs, please fill out Work Orders and submit to the Physical Plant Office. Event Recycling: You can now request new well-identified recycle bins in racks of 2, on the same workorder as your table and chair set up request. For Parties of Less than 10: There is one rack with one recycle bin and one Trash bin. For Parties of 10 or More: Request one or more racks consisting of two recycle bins each. Trash bins will be the normal size trash cans you see at events. Special electronic waste pick-ups on campus collect pallets of "e-waste" from the college community and local residents. 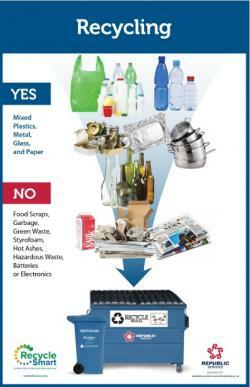 Used batteries (except automotive, marine, and motorcycle) may be recycled in numerous locations, as seen in the below attachment. Acceptable battery types include Alkaline, NiCad, Carbon Zinc, Lithium, Nickel and metal hyd.